Iguazú National Park, straddling the borders between Brazil and Argentina, is an awe-inspiring location centered around Iguazú Falls, one of the world’s largest cascades. More recently, it was named one of the 7 wonders of the natural world. With the notoriety that Iguazú has gained since the location became accessible, the increased demand has left the park with few options of crowd control. Buses deliver gawking tourists to the paved entrance daily, and there is no shortage of greasy food options and kitschy souvenirs available. The feeling is not one of a connection to nature, but more akin to visiting an amusement park. The “Disneyfication” of natural spaces in order to increase the accessibility to tourists is a shift away from the very foundation of why national parks were created. In the mid-19th century, America designated their first parks thanks to a societal shift in how nature was viewed and, ultimately, to what extent it is appreciated. Largely known as “romanticism”, these parks were intended to provide an experience through providing access to aesthetically pleasing locales which create varied emotional responses. National parks are managed, but largely left as wild. Park rangers work to maintain trails and visitor safety while educating, but people venture into the wilderness to feel the remoteness that drives a reconnection with our roots in the natural world. 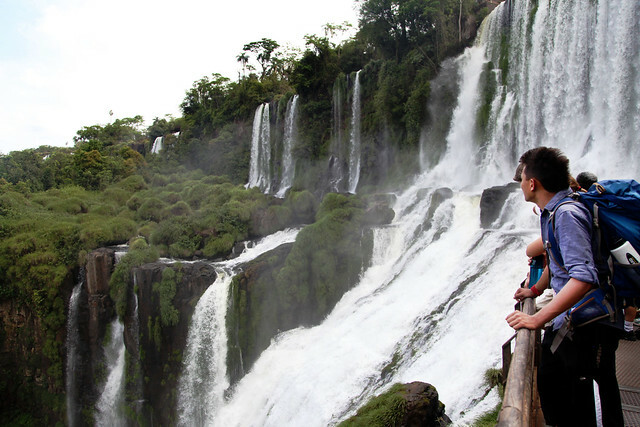 The public portion of Iguazú National Park does little to afford the time or space to achieve these feelings. What remains is undoubtedly an impressive cascade. However, the built up pathways and buildings plus the sheer amount of people make finding space for personal reflection near impossible. Upon first sight of the falls, the feeling of being small in the face of nature’s sheer power and beauty is inevitable. That feeling is fleeting, dissipating quickly as other tourists shove their way toward the barriers, shouting and speaking loudly, anxiously awaiting their opportunity to take a self portrait. It seems there is a greater focus on visiting to get the shot and claim ownership of the location through the iPhone – which, unbelievably, receives enough cellular service to post straight to Facebook or Instagram. For a location that commands respect, it has been reduced to a brief shock-and-awe before visitors shuffle like sheep back to the train that made their visit a passive possibility. Iguazú is an amusement park, not a national park, providing entertainment in the form of a spectacle and access to an extensive buffet of food and merchandise. It is not nature that is being made more accessible here, but the experience of being entertained by a natural source.